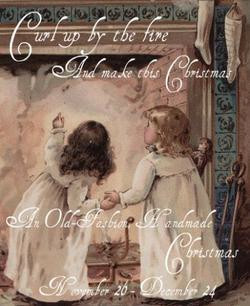 Grace over at Grace's Garden Walk is hosting and "Old Fashioned Handmade Christmas" event! You are supposed to do your own tutorials on how to make something. Each week you have a different theme for your tutorials, and this week is paper! So I'm going to do a tutorial on how to customize plain notebook paper for writing letters to friends. This didn't turn out very good, because although I took pictures, the internet is too slow to upload them, and the computer freezes. *bangs the keyboard with her head* Sorry about that, I got mad. Well actually I didn't bang the keyboard, but you get the point, right? Oops, I'm fading for the subject of this post. Dear me. That's something Susan from The Chronicles of Narnia would say. Did you know they have a new Narnia movie coming out? AHHH! Sorry, I simply must stay on the subject! This picture was from another old post, and so I copied it onto here, that's different than uploading it from the computer. It's a terrible picture too, it was from a long time ago and I took it in the dark because Nehemiah liked walking on the bed (which is where I took this picture) to the window, and he banged on the window when the light was on. . . On with the tutorial. This really isn't a tutorial where you have to do everything a certain way. Use your imagination! I like to do vines and swirls on the side of mine. You can see that a little in the picture. Make it pretty, but don't do too much! Remember, it's the letter your friends are reading, they aren't looking at your drawings! If you aren't very good at drawing this tutorial isn't really for you . . . if you have good penmanship (I don't) you could write quotes on the side. You can also use stickers, those are fun! She's also giving away a book and some very nice note cards, make sure to go over and enter! Here is the book she is giving away. I've heard good things about it, and of course I'd never pass up entering for a book. ;) Grace is shipping overseas by the way. And these are the note cards she's giving, there are more too! 1. If you had to choose between living on a desert island or tropical rainforest for the rest of your life, which would you choose? 2. What is your favorite music CD right now? I don't really have one . . .
3. If you were given the choice between wildflowers or roses - which would you pick? 4. How much do you like notebooks? Is it mild, or are you absolutely obsessed with them? Uh, I'm not obsessed with them. I don't hate them, you have to use them. 5. What is your biggest goal this winter? To become more like Jesus Christ. That will always be my #1 goal, because I'll never be perfectly like Him, but I always want to be getting closer to be like Jesus. 6. If you could change your hair however you wanted, what would you do? I like the way God made my hair, it's fine and I don't really care much. 7. Do you think Harry Potter is bad? 8. Why do you think pink is a girls' color? Hmm . . . well it's always been a girls' color, you know? Even though I don't like pink. :P I'm weird, I know! 9. Would you be up to singing a solo in front of a thousand people? It would be a little freaky, but I could do it if I was singing about Jesus. 10. What colors look best on you? I don't remember. Ask my Mom. 11. If you had a different name, what would it be? Probably Kendal, or Johnny. Joking! Samuel and Solomon Busch call me Kenny though. uh huh. I don't know why. Sneakers! Boots are fun if you're in the snow though. OR in the mud. Actually that's more fun barefoot. What are flats? I'm not into the latest fashions. a best friend or a group of friends? I think that's all . . . what have you been reading in your Bible lately? It's always fun to see what others are reading. I'm studying 1 Samuel and 1 John. I can only really tell you what works best for me and how I've found ways to get more into God's word. For one, I found that I couldn't really get into God's word with just reading it through. Then I would just read without reflecting and "reading without reflecting is like eating without digesting"--so not good. What I did, then, was I got a note book and as I read, I would make comments and summaries every few verses or so to help me think more on what I was reading. If I didn't understand something, I'd highlight it and hope to come back to it another time--or google a response the next time I hit the computer. In this way, I find I can be more aware of what I'm reading and interact a bit more. Another way is to read the books that have more plot first. The other books like Leviticus and Numbers are great, I'm sure, but I know if I try to read them right now, I will fall asleep. So, start with the story of Jesus, read Esther, Genesis, Exodus, Judges. Read the books where stuff is happening and where you can imagine how things were like. Making a movie in your head as you read to visualize what things were like. Thirdly, read differently. This one I just really started to recently. I still take notes on whichever book I'm reading, but I've also started reading books in one-two goes. So I'd take Matthew and read it straight through. Or, well, half-through and then the other half the next day, without notes. In this, you can see the connections between everything better and you'll find it is more like reading a good novel. Praying about it is good. That's how I started. Praying to want God more and praying to understand what his word is telling me. This was by no means an instant change. It takes work and persistence, I find--or at least, for me it did. Everyone is different though, but if you keep at it, I'm sure you'll become engaged. (2)Another way is to read the books that have more plot first. The other books like Leviticus and Numbers are great, I'm sure, but I know if I try to read them right now, I will fall asleep. So, start with the story of Jesus, read Esther, Genesis, Exodus, Judges. Read the books where stuff is happening and where you can imagine how things were like. Making a movie in your head as you read to visualize what things were like. Okay, in which I try not to talk to much and speak clearly. To change your entire blog to one nice font of your choice follow this code changing steps. P.s. There is also Page title font and header font - just switch the default text (probably Georgia) to your text. Hello, Kendra! Sorry I have not stopped by this blog for a long while. I have missed you so much as well!!! Thanks so much for entering my blog event. Unfortunately, the pictures you loaded do not show up on my computer screen. Are you able to link up your tutorial to my Weekly post on my blog, or will the linky not work on your computer?